So I am still on the no sugar added kick! And even though I don’t crave chocolate nearly as much as I use to. I still have a sweet tooth and every once in awhile really crave chocolate! 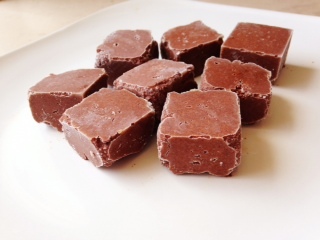 Introducing No Sugar Added Fudge. The best part: no baking involved and only 5 ingredients! I call this a win! Now I love this fudge. However, I must warn you that it is a speck on the bitter side do to the cacao and no sugar added. 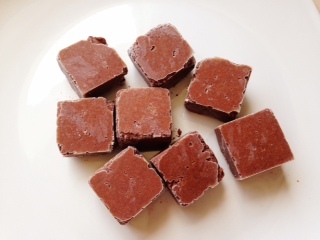 But, if you like dark chocolate then you will LOVE this fudge! Blend all 5 ingredients in a food processor or blender. Place in silicone ice cube trays. Freeze for a few hours or until hardened. Keep in freezer. You can also use unsweetened cocoa powder. Can easily be doubled, tripled etc. 17 Responses to "No Sugar Added Fudge"
Going to make this right now. Seriously that is perfect for what I’m craving right now! BOOM! Do you know what the calorie count is for each fudge piece? Or of the whole recipie altogether? Thanks! I would try online. You can probably order it through amazon or iherb. I hope that helps! This was so delicious! Just linked it on my blog and also shared it on Instagram. It’s a must try! I am soo happy you liked it! Thank you again for sharing it on your instagram and website!!!! You could try apple sauce. Unfortunately, this is a recipe where you really need the coconut oil in order for it to harden. It doesn’t taste like coconut at all though. Maybe give it a try and see what you think? Really do not care for bitter chocolate. Could I add a sweetener like Swerve or erythritol? The ripe banana helps with the bitterness, but you can add anything you want. It would be great with honey, agave, or any type of sweetener. The coconut oil can be normal because it will blend together in the food processor.